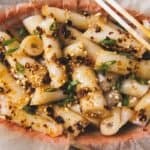 This recipe yields about 15 to 20 rice noodle rolls, depending on how much batter you use for each layer. You can halve the recipe if you want to make fewer rolls. I often have two woks going to shorten the total cooking time. In a large bowl, whisk together the rice flour, potato starch, tapioca starch, cornstarch, sugar, and salt. Create a well in the center of the flour. Gradually drizzle the 2 cups of room temperature water, stirring everything together with your whisk. Once the flour and water is well mixed, gradually drizzle the 2 cups of hot water into the batter and whisk. You do not want to pour all the hot water in at once because it will cook your flour and starches, causing everything to clump up. I usually pour a small stream of hot water and whisk at the same time. Add the canola oil and whisk to incorporate the oil to the batter. **Add water to your wok (or sauté pan), cover the wok, and bring the water to boil. I usually add enough water to cover the bottom 2 inches of my wok. Fill a large pan or bowl with cold water and leave it in the sink. Once the water boils, place a steaming rack in the center of the wok. Brush a thin layer of oil over a large plate (or cake pan) and place it over the steaming rack. Give the batter a stir to loosen the flour that has settled to the bottom of the bowl. Pour 1/4 to 1/3 cup of batter over the plate. Use a spoon or chopsticks to spread the batter so that it covers the entire surface of the plate. Cover the wok and let the rice noodle cook for 3 to 4 minutes, until bubbles start to form on the noodles. Uncover the lid and use oven mitts or a towel to help you remove the hot plate from the wok. Carefully place the plate over the cold water and let the rice noodle sheet cool for a minute. Get another layer of rice noodles cooking while you wait for the first one to cool. To roll the rice noodles, run a spatula along one edge to release the sheet of rice noodles. Start lifting the sheet and roll it up into a long log. See photos above for reference. Set the rolled up rice noodle aside. Continue cooking the rest of the batter. Cut all the rolled up rice noodles into 2-inch sections. Serve the cheung fun with my teriyaki sauce, chili oil, chopped peanuts, sesame seeds, and scallions. You can also eat the cheung fun with soy sauce and sesame oil. Refrigerate leftover rice noodle rolls for up to 3 to 4 days. They are great for stir frying. *Tapioca flour and tapioca starch are usually the same thing. **If you notice a significant amount of water has evaporated halfway through cooking, add another cup of water to the wok.